Down at my local Nordstrom this week, to my surprise I found the classic Estée Lauders packaged in new bottles among the regular perfume offerings. In the past, if I wanted to sniff Azurée or Estée, for instance, I had to ask at the cosmetics counter and hope there was a tester hidden away somewhere. But now, here they were, lined up like little perfume soldiers in plain sight. I asked for a sample of Spellbound. Perfumer Sophia Grojsman developed Spellbound, which launched in 1991. Its notes include fruit notes, coriander, pimento, orange blossom, rose wood, rose, carnation, lily of the valley, jasmine, ylang ylang, tuberose, heliotrope, amber, musk, opopanax, civet, cedar and vanilla. Grojsman is known for her skill in creating soft fragrances weaving feminine peach or apricot, classic florals, and especially rose (think Lancôme Trésor, Yves Saint Laurent Paris and Yvresse). Spellbound fits right into her portfolio. Spellbound kicks off with an assertive dose of pepper. Once I tasted a Beaujolais that was so peppery that I did a double take. The waiter said, “I know, right?” and made like he was grinding a pepper mill. That’s the kind of upfront pepper we’re talking about here. It lasts only seconds, though. On the pepper’s heels is a kick of cinnamon and clove with a tiny bit of green bean snap. But, like custard, you really don’t want to overdo it. A few bites are plenty. Spellbound could bring down entire villages if worn unchecked. (This leaves me to wonder how many people call it “Smellbound.”) Spellbound keeps its vigorous, yet downy soft, sillage for hours, too — potentially long after you’ve had your fill. I recommend dabbing rather than spraying. I imagine Spellbound wearing best when it’s cold out, both to tighten its sillage and to counteract the fragrance’s warmth and sweetness. It’s not a particularly youthful fragrance, but I wouldn’t call it “mature.” With its sweet, silky edges, maybe a good label would be “maternal.” But this is one voluptuous, loud-talking mama. In its newest packaging (above right; old packaging shown at left), Estée Lauder Spellbound Eau de Parfum sells for $65 for a 50 ml bottle. It’s available at many department stores and online. 2. Someone take away my metaphor license! In one paragraph I’ve compared Spellbound to a furnace, a pillow, and a custard. Yikes. Voluptuous etc. or not, I can definitely imagine enjoying Spellbound more on someone else. That way you can drink it in, then walk away when you’ve had enough! I wonder what a “Vertigo” themed scent would smell like? That sounds as scary as the movie! I kind of get a chill thinking about it, too! Lauder could do no wrong between the early seventies and the mid nineties. Now their brand is all over the map, with a lot more misses than hits, and they’ve reformulated all their old greats. Such a shame. Now I’m wondering if I confused Knowing and Spellbound when I was getting my samples, aiming for a chypre?? I didn’t smell Spellbound back in the day–or I don’t remember it if I did. It would have been great to compare the old and new. 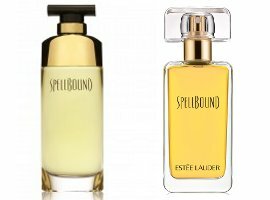 I don’t know what Spellbound smells like these days, but I smelled Knowing in the department store a year or so ago and it’s been unsurprisingly transformed into “modern chypre”: no oakmoss, lots of patchouli. If you got your hands on a vintage sample you would be able to tell the difference instantly. I hope you get the chance to smell some of the old Lauders. I especially like Azuree, Aliage, and Private Collection. And I’m glad somebody enjoyed those metaphors! I have a mini of Spellbound in a set I bought at a garage sale. The mini of Knowing was missing, and darn was I cross! So far I have filed Spellbound under the classificatoin ‘ ‘orrible ‘, but I’m always willing to try again. The weather is bitterly cold here now. I like your concept of how sillage can be ‘tightened’ in the cold. I swear I have Lauder minis around somewhere–or at least I used to. As soon as I’m finished here, I’m going to see if I can find some Knowing! Yeah, that’s a dabber too. As others have said, Knowing is really very special (or was). Many, MANY moons ago, Spellbound was the first fragrance I bought for my mom! It’s lusciously curved architectural bottle holding its Golden Nectar…. Just the name takes me back, it as the first of LITERALLY, over 100 bottles of fragrance I have bought for my mother in the past 20 years or so. It’s still a benchmark and a sentimental favorite! She rarely uses it anymore because it’s so treasured but this review reminds me why I purchased it in the first place! It is a HUGE fragrance but my Mom can and has always been able to carry off fragrance A-Bombs with the innate grace of a diva borne to them! And she pulls off this Armageddon of a scent with the surest ease! I Love You for reviewing this scent! Take Care, Mon Angel, Angela! I always love your comments, The Nose Knows, because they are so full of passion and enthusiasm! With your warm personality, I bet you pull off a big fragrance just as well as your mother does. ‘Ambre’ is the French term for the oriental family. Well, that explains a lot. Thank you! I’ve never even sniffed this one, and a dab would have been just the ticket this morning, with the weather turned cool and drizzly again. I will have to look this up, along with Knowing. I should know better than to read your reviews of vintage frags, Angela. Just when I thought I was getting control of my eBay obsession…. Now I think I might put on a dab of vintage Nahema for the evening. I just wore Nahema for the first time in ages a few days ago! At least the classic Lauders are relatively easy to find (in the U.S.) and not too pricy. Yes, that’s true. I like that they don’t “put on airs.” It’s a funny thing with EL frags and me, though. While I really admire them, and own a few small bottles, I never really love to wear them myself. I just like to sniff them from time to time, and appreciate them on others. Weird, I know. I get that. Sometimes it’s enough to know that something exists in the world–not that you have to have it in your everyday life. The penny just dropped! I have realized that I really like Spellbound and Cinnabar but I could not actually wear them, in the same vein as Vivienne Westwood’s Boudoir. I also liked the original Knowing. Azuree is a powerhouse to wear which I do like. LOVE Aliage! Still lamenting the discontinuation of White linen Breeze. I remember how much you love White Linen Breeze! I’ll cross my fingers that they reissue it someday. Nope, not weird, Ann. I do that ALL THE TIME when I venture into my local Macy’s or L&T. I think doing so takes me way back to when we had a Read’s Department store (the kind that contained a luncheonette and hair salon) in town and I would sit at the counter and look at all the pretty bottles while my mom shopped for her cosmetics. It’s funny figuring out where some of our obsessions start! Thank you, Angela! You have a great memory. Maybe one day I’ll find ELWLB at Winners, the Canadian version of Ross. I got Pure White Linen Pink Coral there and have loved it. Not sure I’ve ever tried this one. Probably dissuaded by LT and TS. Will look into it. They did a mighty fine job of dissuading people, that’s for sure! And you may not like it. But it’s worth sampling simply to have in your mental encyclopedia of fragrances, I think. Spellbound was my favorite in high school, but I couldn’t afford the perfume, so I asked for the perfumed lotion for Christmas and got it. I felt very mature and glamorous when I wore it. You are right about the knocking out a village. The lotion was just enough without being overwhelming. Sometimes body products are the perfect solution. I love the faint, all-over scent a shower gel or lotion leaves. A review of one of my favourite fragrances! I know I am such a broken record but I adore the older Estee Lauder creations. Youth Dew, Knowing, Spellbound, Private Collection… they just smell so beautiful! If I have to say what I think about these perfumes is that they are “self-assuring, confidence checkers” to the people wearing them. When you know you can pull them off, you pretty much have the capacity to take on whatever life throws at you too! I love the idea of perfume as a power-booster! It sounds like your skin and your personality set you up to wear the big guns successfully. It’s almost a Murphy’s Law of perfume! Oh yeah, and glad I got some Tuscany Per Donna before they switched the packaging. I really like the bottle for some reason. It did have a darling little bottle! You’re lucky, then, that it’s still in production. I give Lauder credit for that. Random unperfume related comment: I spent a goodly amount of time yesterday hunting down metaphors for my son who is preparing for his English final (6th grade, oy! )… Similes abounded, but not metaphors… I will have him read your review! It is a storm surge of metaphors I am after! …And Bingo! “Storm surge” is perfect!